I will review a book only if I like it…and I’ve been through some clunkers lately! I am pleased to find one worth praising and sharing with you today. I’m thinking of adding a second blog post starting Fridays to cover my NYC adventure. I have several weeks of Wednesday posts lined up, so it appears if I want to tell all these great stories, I need to blog more! Marianne Leone is a force of nature. If she wasn’t born with the fierceness of a lion, she found that fierceness when her son, Jesse, was born ten weeks early. A cerebral hemorrhage just a few days into his new life caused a host of physical problems, including cerebral palsy and seizures. Yet despite quadriplegia and an inability to speak, Jesse managed to flourish. With the help of his tenacious parents, he lived a full, rich life. 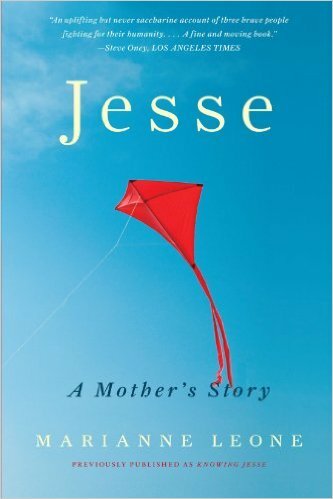 His loving mother tells his story in her book, Jesse: A Mother’s Story. Jesse is beautifully written, with wonderful imagery. Ms. Leone has also included several photographs and poems Jesse wrote. Her book is a powerful education to people of how to relate to people with disabilities. Often people misjudged Jesse’s intellectual capacities, which were substantial, because of his physical challenges. Both of us turned to writing a book as a way to bear witness to our children. Mine, When a Grandchild Dies: What to Do, What to Say, How to Cope, addresses the unique grief of grandparents, which is too often underrepresented in bereavement literature. I wrote it to honor my daughter Reba, who was stillborn. Jesse: A Mother’s Story will join other brilliant books, such as My Left Foot, as testament to what is possible when someone believes in our potential, regardless of what appears on the outside. Stories like yours and Ms. Leone rip my heart out. I applaud both of you for enduring tragedy and bringing something positive from your experience. Marianne is so remarkable. She was such an advocate and fighter for her child. Now she still advocates for others in honor of Jesse’s life. I have such respect for her!